Michael - Dopamine is a really interesting chemical in the brain that does lots and lots of things. One of the things that it does is send a signal within your brain when something exciting potentially is about to happen, something rewarding. And so, it's involved in motivation. Now, we found within cannabis users that there was a correlation so, a relationship between their motivation levels and their dopamine levels. What we found was that the lower their dopamine levels were, the more unmotivated that they felt. Hannah - So, your brain lights up with dopamine and reward when you're feeling things of pleasure and when you're getting keyed up to be motivated with something and cannabis actually decreases the amount of dopamine that's in your brain. Is that right? Michael - What we think is happening is that if you smoke cannabis, that it probably releases a bit of dopamine. When people smoke lots and lots of cannabis over time, the same with recreational drugs that people can use, the dopamine system can become used to being stimulated. And so, it tries to adapt by lowering the amount of dopamine that it makes. Hannah - How much cannabis would you have to smoke in order to rewire and alter your dopamine pathways in the brain? Michael - In our study, all of the cannabis users were quite heavy cannabis users. So, most cannabis in the UK is sold as 1/8th which is 1/8th of an ounce. That's roughly 3.5 grams. The cannabis users in our study was smoking a quarter of an ounce of cannabis a week which is quite a lot. So, we're talking about, at least from this study, quite heavy use. I think more work needs to be done to answer that question. I think the other really interesting thing is, increasingly, we're understanding bit more about the different chemicals in cannabis. So, there are probably almost a hundred different chemicals in cannabis. Depending on the balance between these, that they probably have different effects on the brain. So, there's one called THC which is the main one and another one called CBD. What we think is really important is, it's the balance between these as to the effects that they have on the brain in the short term but also the long term. Hannah - So the bottom line then in your studies at least, regular cannabis use, so at least a few times a week can actually decrease or desensitise your brain's reward pathways so that you might get feelings of apathy and lack of motivation? Michael - Certainly, that's what we believe based on the findings that we have. I think the story is beginning to fit together. 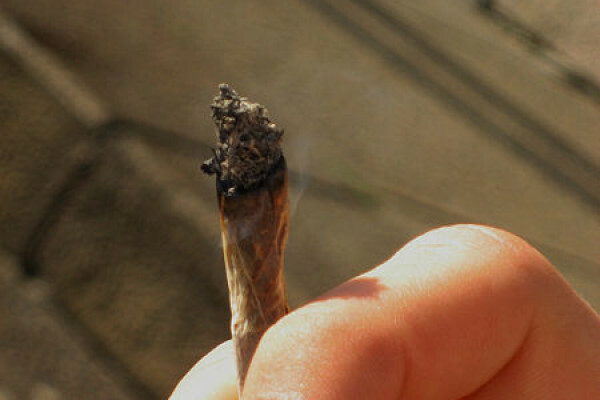 Almost half of young people have tried cannabis at some point in their lives. I think that smoking lots of cannabis over a prolonged period of time does seem to have this effect. There is some work that's been done in the past that has looked at educational outcomes and it's found that people who smoke lots and lots of cannabis, and then importantly carry on smoking lots of cannabis can affect how they do at school or university or in their work life, and this might tie into that quite well. The other thing as well is that there's some evidence that people who smoke lots of cannabis regularly are more likely to get depressed. This is a bit more controversial because it's very difficult to tease out if cannabis is making people depressed or if people who are depressed for example have low mood and more likely to smoke cannabis to try and feel better about it. But also, we know that this chemical dopamine is probably involved in depression as well. One of the key symptoms of depression is not being able to enjoy things. And that's - if anything - the one that people find the most upsetting is they're not able to enjoy things that they used to enjoy. I think it may tie in with that as well, but I think again, needs to do more research into how all these things affect dopamine and how that affects how we feel. Hannah - And those people who have smoked cannabis regularly, if they stopped smoking now, would the brain rebalance itself and re-tweak itself so that they could feel feelings of joy and reward, and motivation later on? Michael - Some of the studies that had been done have looked at people who used to smoke cannabis. In those studies, they've only found very, very small defects if any, on the dopamine system. So, what we think happens is that after a period of abstinence that the brain gets back to normal again. And so, I think if people are worried about the amounts of cannabis that they're smoking, if it's having negative effects on them then my advice would be to either stop or at least cut down the amount of cannabis that they're smoking. Next What does your face say about you? Does religion have an evolutionary role?